Received 1 February 2011; revised 20 April 2011; accepted 27 April 2011.
and other subjective symptoms of influenza. 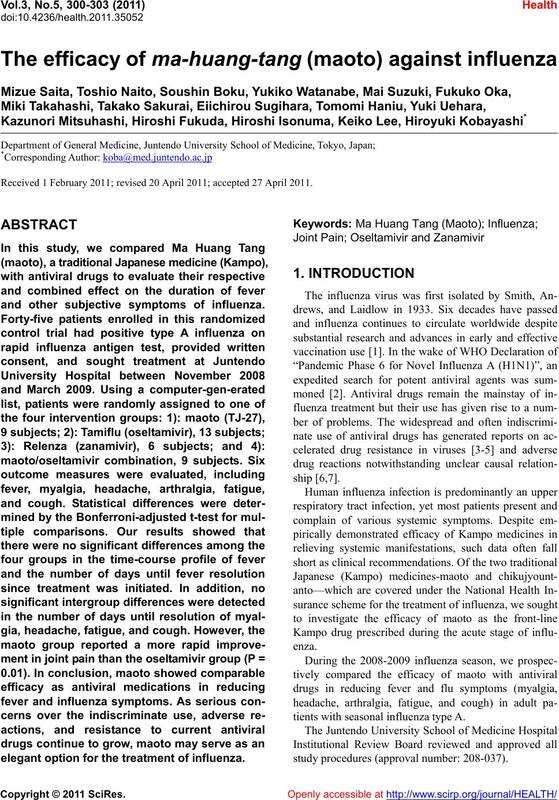 elegant option for the treatment of influenza. tients with seasonal influenza type A.
study procedu r es (app roval number: 208-037). 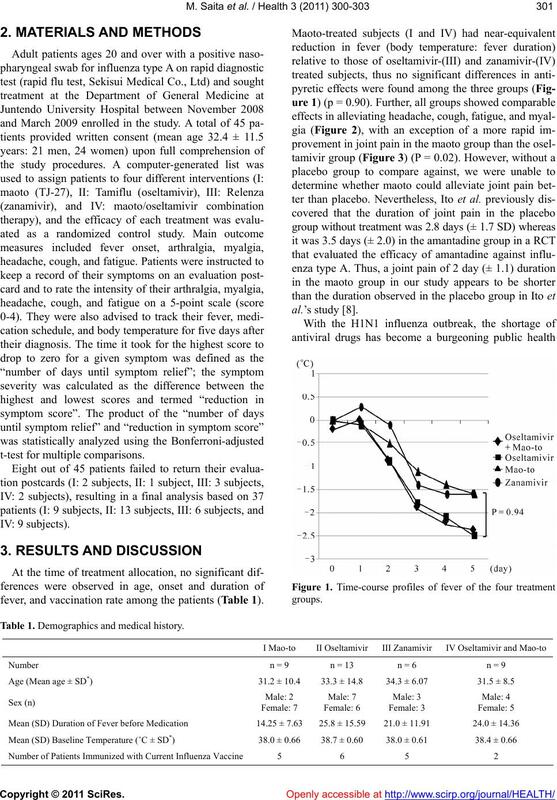 fever, and vaccination rate among the patients (Table 1). Table 1. Demographics and medical history. Figure 2. Severity of headache, muscle pain, cough and fatigue. Figure 3. 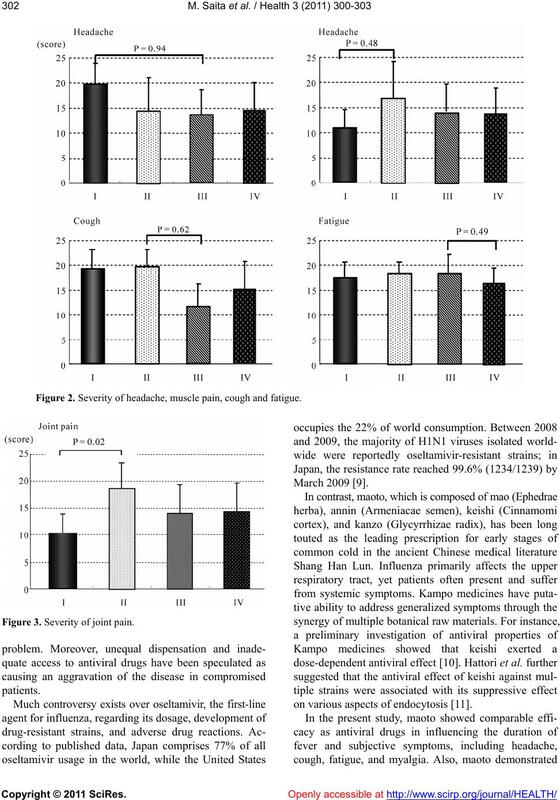 Severity of joint pain. on various aspects of endocytosis . oseltamivir alone in shortening the duration of fever . are specifically designed to suppress viral replication. 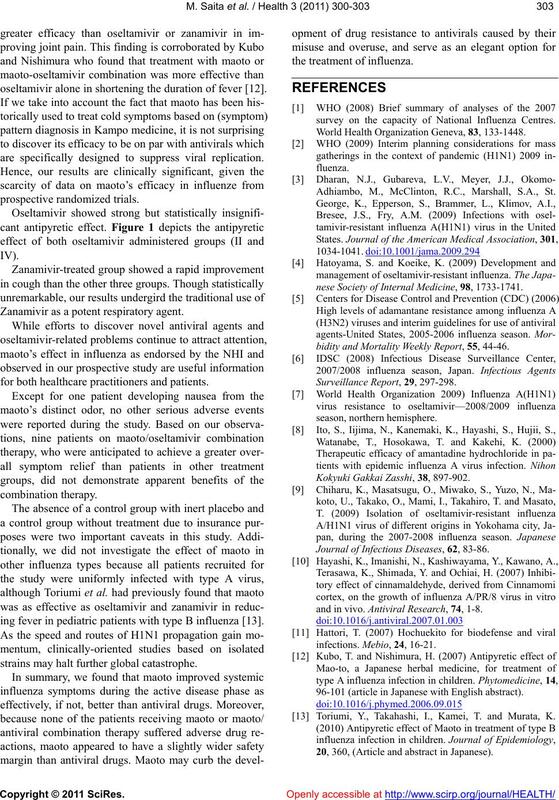 Zanamivir as a potent respiratory agent. for both healthcare practitioners and patients. ing fever in pediatric patients with type B influenza . strains may halt further global catastrophe. survey on the capacity of National Influenza Centres. World Health Organization Geneva, 83, 133-1448. Adhiambo, M., McClinton, R.C., Marshall, S.A., St.
nese Society of Internal Medicine, 98, 1733-1741.
bidity and Mortality Weekly Report, 55, 44-46. Kokyuki Gakkai Zasshi, 38, 897-902. Journal of Infectious Diseases, 62, 83-86.
and in vivo. Antiviral Research, 74, 1-8. 96-101 (article in Japanese with En g l i s h ab s t r a c t ). Toriumi, Y., Takahashi, I., Kamei, T. and Murata, K.
20, 360, (Article and abstract in Japanese).